Door Hangers are the perfect tool for branding yourself as the neighborhood expert. They catch attention, provide the perfect reason for canvassing, and are an easy and effective leave behind. Here are seven ways to SCORE BIG using Door Hangers. The right door hanger for the right situation is key. Who are you trying to attract? Our Listing Inventory Series of Door Hangers are designed specifically to help agents find more sellers. 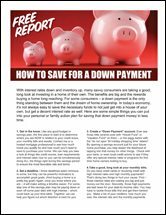 We also offer FSBO’s Door Hangers and Expireds Door Hangers, which are handy to have in the car when you come across a FSBO that just popped up or see an expired come off the market that’s close by. In addition, you can use door hangers to brand yourself, spotlight a new listing, or advertise an open house. The possibilities are endless. Often agents will put time and energy into getting their message right, then forget to tell their prospects what they want them to do next. Always make sure there is a call to action that’s simple and direct on your marketing pieces. 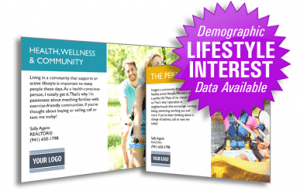 For a memorable call to action select our Free Competitive Market Analysis Door Hanger. Know how many homes are in the neighborhood you are canvassing. Then, based on the number of homes, come up with a strategic plan for conquering the whole area over time. An easy way to confirm how many homes are in a neighborhood is to use a tool available on our EDDM page (HERE). Once there click the “Get Started” link. On the next screen, there is a link to “choose your carrier route” this tool will allow you to find out how many homes are in a given area so you’re sure to order enough door hangers. 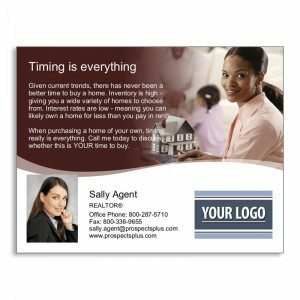 Keep a variety of door hangers available to address different niche markets so you are prepared for any opportunity that might cross your path. Many agents stock their trunks with various materials including, objection handling brochures, extra business cards, listing agreements, presentation folders, and door hangers. As the saying goes, “To be prepared is half the victory”. If you want to just get the hangers on the door without actually talking to many people, mornings (after people leave for work) are good. If shaking hands and making connections with potential sellers and buyers is what you are after, then early evening after people have made their way home, is a smart choice. Take your team along and create a plan of attack that includes breaking up the canvassing in sections. Then blitz the neighborhood from all sides and begin the process of branding the area and officially introducing everyone to the new area experts. Prior to delivering door hangers to a specific neighborhood or in conjunction with this effort, make a few phone calls, send some agent introduction postcards or a community newsletter. 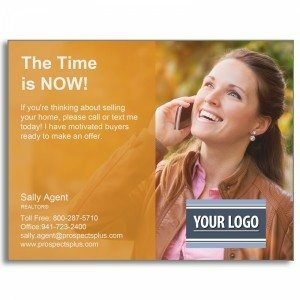 That way when you are meeting face-to-face, your prospects will be more likely to recognize you as the ‘neighborhood expert.’ If you’re using the listing inventory door hangers, we have Listing Inventory Postcards that compliment them nicely. You can find them here. Get prepared for your next FSBO sighting by ordering 100 FSBO Door Hangers today to have available to leave on the door of the next home you see with a FSBO sign. PLUS: Get Instant Access below to 3 FREE tools that will help you CONQUER Your Market this year! You may already be familiar with these tools, but are you really making the most of them? When strategically used, not only do they make your work life a lot easier, but they will help you generate new business as well. Your smartphone is the one tool you’ll use more than any other in your real estate practice. Most REALTORS® — more than half – use the Apple iPhone®, according to NAR, second in popularity is Android™. While a smartphone’s features are critical in an agents decision-making process, the types of apps it can run and their ease of use is important to consider as well. Again, the iPhone® gets the award – this time for the sheer number of apps, but the number and variety of Android™ apps are increasing. When making your final decision, be sure to compare the audio quality on speakerphone and Bluetooth. This is important since you’ll most likely use the phone a lot while driving (if that’s legal in your area). And the audio quality between phones can vary greatly. At the beginning of your career, you’ll probably rely on your phone to take photos and videos, take time to verify the photo and video display and resolution are high-quality. Most newer Apple iPhone® and Android™ phones do an adequate job of capturing images and video with high-quality resolution. RPR Mobile – easily search properties, create and send branded reports. BombBomb – send personal video emails to your clients from your phone on the fly. Waze – up-to-the-minute traffic updates by other users, great time-saving while on the road. Open Home Pro – bring your tablet and get digital sign-ins at your next open house. Then follow-up with automated emails and text messages. Videolicious – Make and edit high-quality videos in seconds, including watermarks and logos. From day one of your real estate career, you’ll be hitting the ground, drumming up business. Unless you plan on going through piles of scraps of paper to keep track of all the contacts you’ll make, you need a customer relationship management system. The CRMs of today are used for a number of tasks – from automating some of your marketing to keeping track of your sphere, your prospects, clients (past and present) and syncing data between multiple platforms. A CRM system has become invaluable. These systems are offered by a number of companies but look for one with at least the basics — property blasts, email templates and the ability to monitor client activity on your website. If you’re on an extremely tight budget you might want to start with what the NAR calls “no-frills electronic address books,” such as Outlook and Apple Address book. You won’t get the integrated solutions that you will with the higher-end systems, but at the very least, you’ll get your contacts organized. Three CRMs worth investigating further, Contractually, ZOHO, and Apptivo. Sure, your broker may offer you a page on his or her company website, but you need your own, with your branding. You can spend a ton of money on a website, or you can do what many smart agents are doing and use a ready-made solution. One example is setting up a WordPress site, using an attractive, agent-friendly WordPress theme, such as “Curb Appeal Evolved”. This theme runs under $50.00 and offers IDX plugins, which is the most important tool on any real estate site. Or, check the selection of templates available at Theme Forest. Additional ready-made, agent-friendly website and blog solutions worth investigating include Placester, Websitebox, Squarespace, Wix, and Weebly. 360 Degree Cameras – These cameras create a feeling of actually being inside the property and are able to capture every angle allowing for deeper exploration. A recent study by Magnifyre showed 25% of video watchers preferred 360 videos over traditional cropped format. 3D Cameras – places you inside the property as well allowing you the freedom to look around. There is said to be a greater feeling of depth with a 3D camera. However, you are not able to capture every angle with a 3D camera as you will with a 360 camera. Chatbots – allow you to streamline communication on your website by answering routine questions before you talk to a client. Provides the client another option for information other than picking up the phone. A few Chatbots to investigate further include, Automabots, Structurely, Botplan. Make the most of your CRM, send a Community Newsletter from our Newsletter Series to your Sphere of Influence. 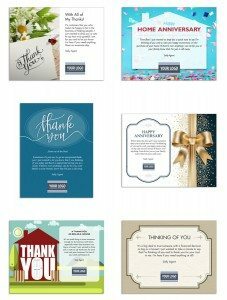 Be sure to notate when the postcards went out in your CRM for tracking purposes.